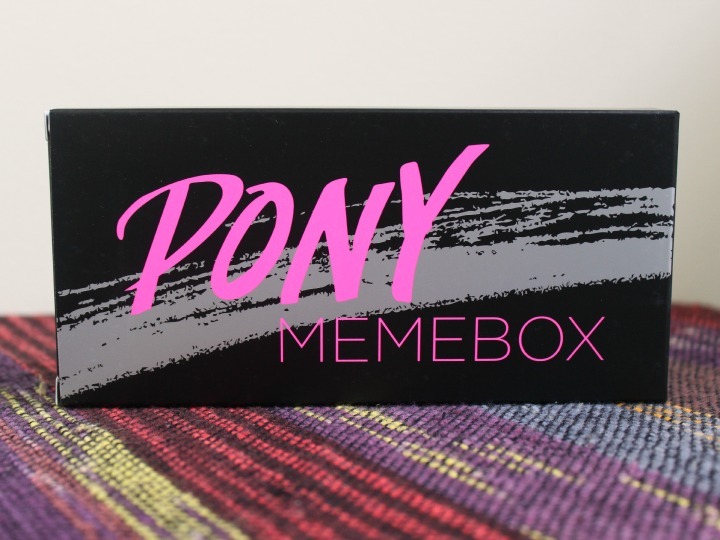 I reviewed the second Pony X Memebox palette collab here a couple of weeks ago because it was a brand new item at the time, but that doesn't mean I've forgotten about the first palette! 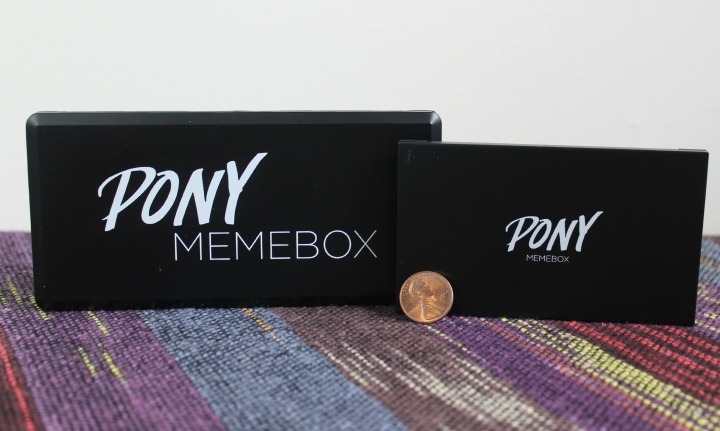 Herein you'll find swatches, comparisons, and my personal observations about the Pony X Memebox Eyeshadow Palette, the original. The classic. Whoosh! The case contains an amply-sized mirror and plastic overlay telling you which shades are which. It's not attached to the palette, so it's quite easy to remove if you wish to. 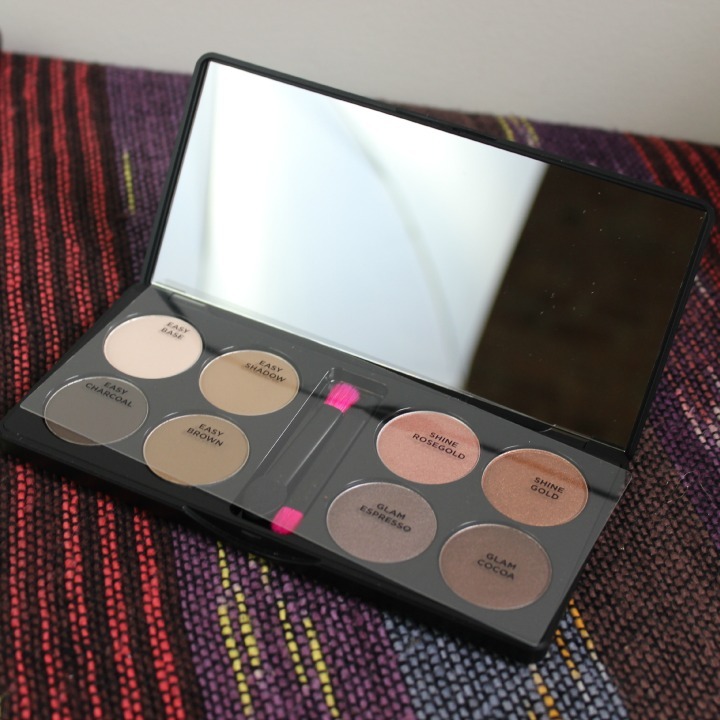 The palette comes with two dual-ended applicators. I wouldn't bother with these—the brush ends don't really pick much up, and the sponge ends are just normal sponges. So I guess if you like sponges, sponge it up. But the brushes are a definite pass. Easy Base: A matte off-white. I found this shade extremely difficult to work with, and it pretty much disappears on my pale skin. Easy Shadow: A light matte brown. Average pigmentation. Easy Charcoal: A dark, almost black, matte brown. Good pigmentation. Easy Brown: It's... brown! Also a matte. Good pigmentation. Shine Rosegold: A very pretty, shimmery rose gold with a hint of sparkle. Not quite as pigmented as the other shimmery/shiny shades, but still decent. Shine Gold: A shiny coppery color with a hint of sparkle. Good pigmentation. Glam Espresso: A satiny taupe. Very pretty! Good pigmentation. Glam Cocoa: A satiny, chocolatey brown. Good pigmentation. Are you ready for your close-up, arm? 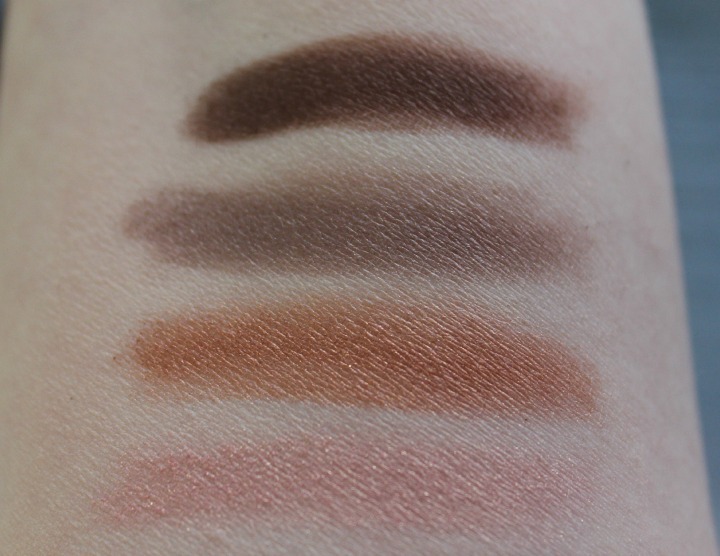 In my post about Memebox X Pony Palette #2 I noted that some of the shades in the two palettes looked similar to each other in the pan, so I thought I'd do a side-by-side comparison of those as well. 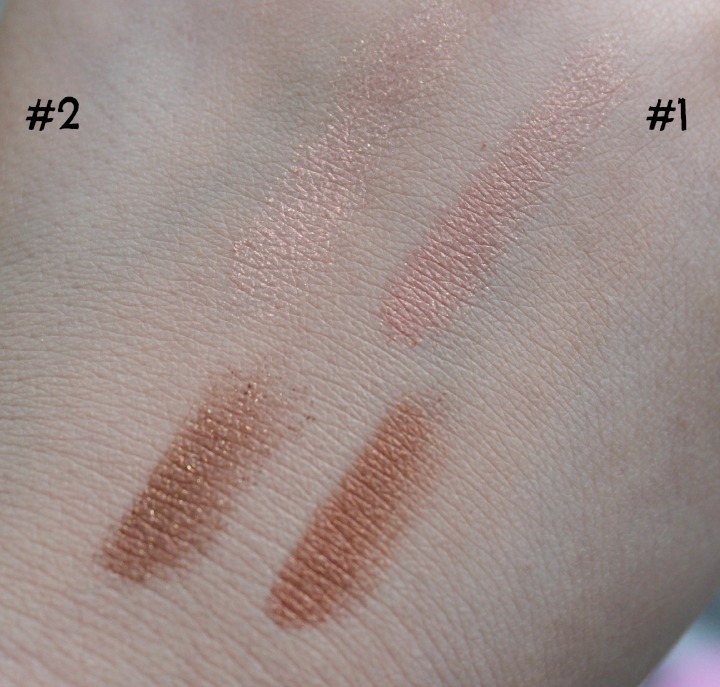 The pinkish shades are Shine Rosegold and Shine Peach in palettes #1 and #2 respectively, and the coppery ones are Shine Gold and Glam Bronze. Good news: They do look fairly different on my skin! 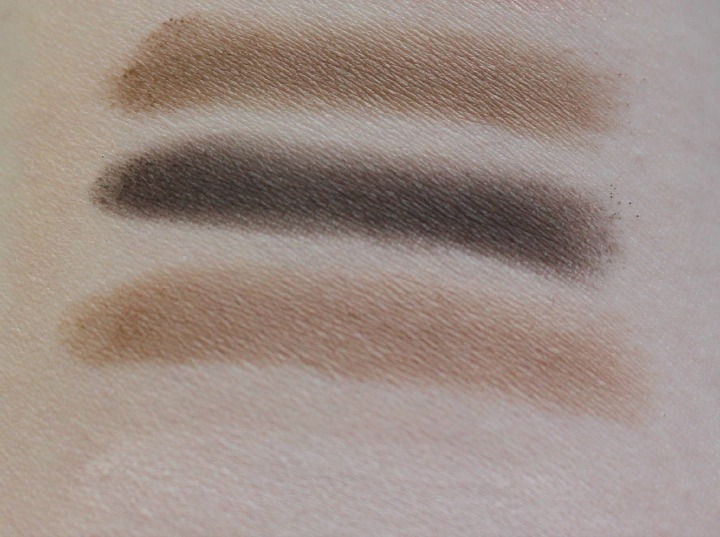 Here are swatches—the shades from palette #2 are on the left and the shades from palette #1 are on the right. Shine Peach vs. Shine Rosegold: Shine Peach is lighter, less pigmented, and more sparkly. The formula is also more crumbly. Glam Bronze vs. Shine Gold: Glam Bronze is cooler-toned and much more sparkly. Both are nice though! Overall I'd recommend this palette for everyday looks, or for folks who don't want to get overly glittery. Yeah! It's back in stock again, so grab it now if you like what you see. Coupon code 35HBV9 will get you $3 off any Memebox order over $30 until January 31st, 2015. And don't forget to check my Memebox Sales & Coupons page for any other deals that might apply! What do you think of the original Pony X Memebox Eyeshadow Palette? 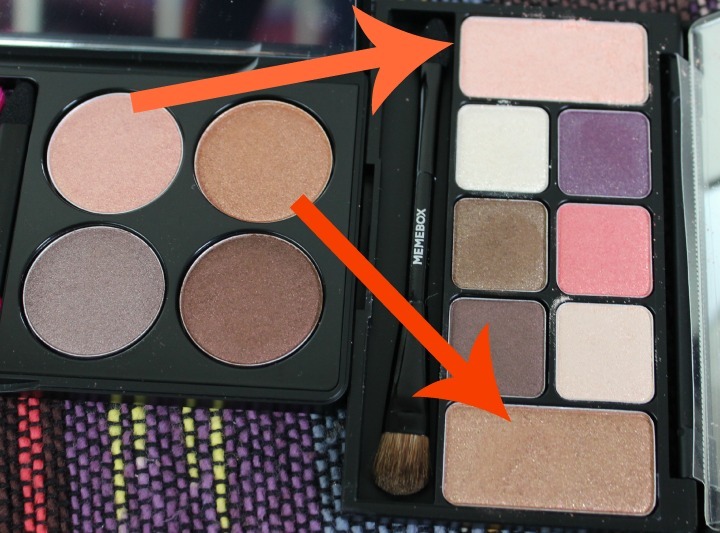 Which of the two palettes appeals to you more? I really love Pony and her videos, but I felt both these palettes were so blah. At least #1 had that purple and pink! For something with "shine" and "glam" in the name, neither of these palettes remind me of Pony's sparklier side with half the palette mattes / satin, and the "boldest" shade being #6. They do look like decent neutral palettes for everyday wear. I do like shade #6 a lot. I think the first one appeals to me more. More neutrals and mix of mattes and shimmer. I've been wearing this one pretty consistently for the last week or so. I think it's quite a good everyday palette. I haven't needed to use a primer except with Easy Base, though I do anyway. I think Memebox was kind of playing it safe with these palettes. A lot of people will wear neutrals, so... yeah. The second one (with the sparkly purple and pink) is kind of fun though. The second palette is definitely more Pony-esque. More sparkle, more color. I feel like they were really playing it safe with this one. It's totally fine as an everyday/neutral palette though! 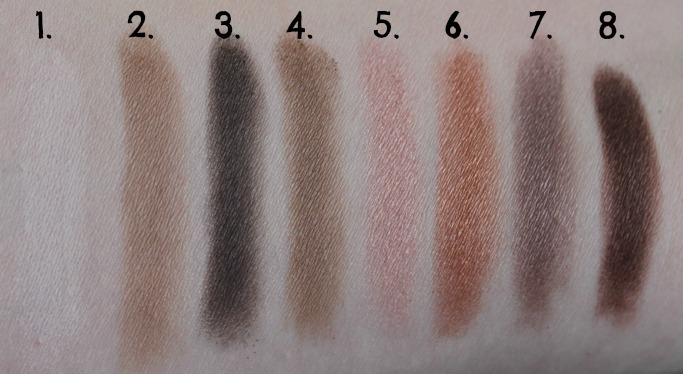 I feel like most of the shades in this palette show up OK without primer, but the problem is that they crease. Not horrendously, but enough that I think primer is a good idea. But yeah, definitely a good palette for everyday wear! True! I don't think a lot of people want the constant glam with the palette. Otherwise, it would be underutilized!